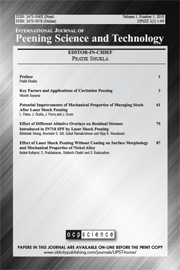 The International Journal of Peening Science and Technology (IJPST) aims to provide a global and multidisciplinary forum for the exchange of the science, technology, developments and applications surrounding the wide variety of peening techniques available. The Journal highlights the latest development which peening technologies have made to provide both scientific and industrial progress. Emphasis is placed on both the theoretical and practical contributions in relation to the methods, technologies, new applications/materials, and evaluates results and developments of enhanced solutions, new experimental methods and associated phenomena. Original research papers, case studies, review papers, short communications, mini reviews and letters to editor are all welcome. The scope of the journal is defined to include but, not limited to, the following areas: laser shock peening (LSP); plasma physics and dynamics; grit blasting; shot peening; blast and laser cleaning; ultrasonic peening; water-jet/cavitation peening; oil-jet peening; ion exchange beam peening; low plasticity burnishing and deep rolling; other material strengthening treatments; issues on plastic deformation and strengthening mechanisms; residual stresses and its management in materials; finite element analysis (FEA) and process modelling of the peening techniques; topographical and micro and nano structural characteristics; change in mechanical, electrical and biomedical properties using such peening techniques and reflects the main areas in which peening methods are used and developed for the surface engineering and for manufacturing applications.